To view the presentation about the Partners Group Global Value Fund please click here click here. 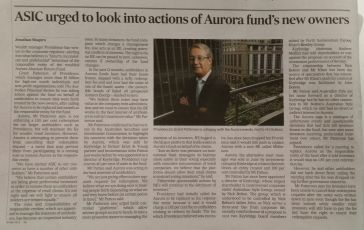 Jonathan Shapiro, 7th September, 2016 “Providence urges ASIC to probe Aurora Absolute Return Fund’s ‘bizarre’ owner”, Australian Financial Review. True to Providence’s promise of transparency and independent analysis, we share the basis of our decisions with our clients in this Quarterly Activity Report July 2016.